One of my favorite Bible personalities is David, King of Israel. Each year when I start my Read the Bible in a Year program, I especially look forward to the books of Samuel, Kings and Chronicles when the tapestry of his life is woven before my eyes once more. Scenes of battling the giant Goliath, avoiding the ire of the mad King Saul, his vagabond years, family issues, his battles and heartaches appear, forming a brilliant panorama of glory and intrigue. And woven subtly into that rich fabric are unique strands of the lives of women—seventeen (including one group), to be exact. What an intriguing lot they are as they impacted his story in unforgettable ways. I thought it might be helpful to have a reference guide for later study of these intriguing women, so I have included one below. Saul’s older daughter; offered to David after Goliath was slain. Ultimately, Saul gave her to Adriel the Meholathite. Some posit that David was unable to raise the money for a bride price, hence she was married to another. Wife from Jezreel; mother of David’s first son, Amnon. She and Abigail were with David during his stay with King Achish of Gath; they were taken captive when Amalekites raided Ziklag; and were among those who went with David to Hebron when he becomes king of Judah. Widow of Nabal. Became David’s wife and bore his second son, Chileab (Daniel). See notes on Ahinoam. David’s sister; mother of Amasa. Saul consulted her after Samuel died regarding concerns about the Philistines. Wife. Mother of Absalom and Tamar. Her royal origins may indicate diplomatic implications for Geshur, an Aramean kingdom, and Judah. Wife; mother of Adonijah. Her name mentioned in three epithets concerning her son. Widow of Uriah the Hittite. Became David’s wife. Mother of Shammua, Shobab, Nathan, and Solomon. David’s sister; mother of Joab, Abishai, and Asahel—all prominent in the royal bureaucracy. Her status may have derived from being David’s sister, and the mother of influential men. Her husband is not named. 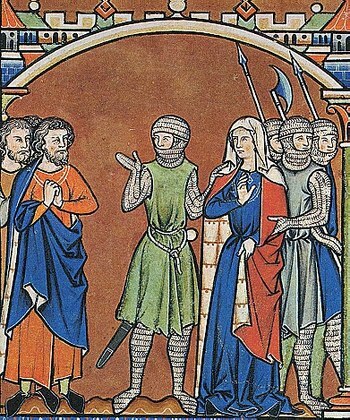 Joab sought her assistance to change David’s mind about Absalom’s exile. She killed Sheba, son of Bichri, to save the city from Joab’s siege. Saul’s concubine whose sons were among the descendants of Saul who were slain as atonement for Saul’s killing of the Gibeonites. Lovely young Shunammite woman brought to David to care for him while he was dying. She became a political pawn as Adonijah plots to claim the throne upon David’s demise. Bore David additional sons. Ten were openly defiled by Absalom in an attempt to seize his father’s throne. Subsequently these ten were put in seclusion by David and lived as widows until the day of their death. Carol Meyers, Gen. Ed. Women in Scripture (2000), “Merab,” p. 124. Meyers, “Ahinoam 2,” p. 48. Meyers, “Maacah 2,” p. 112.